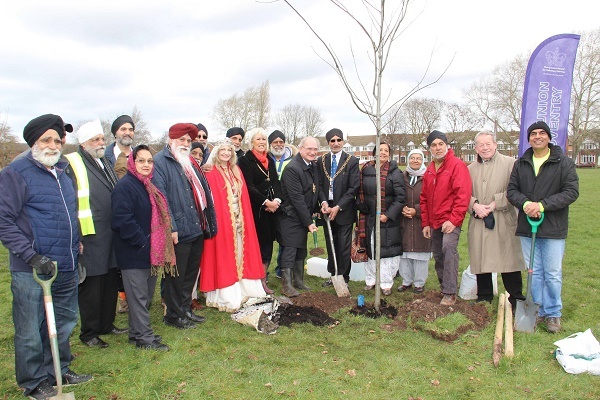 The trees were planted in a bid to plant over 550 trees throughout Coventry’s parks and green spaces to mark the 550th birth-anniversary of Sri Guru Nanak Dev Ji. Lord Mayor of Coventry, John Blundell and Nav Mann, Community Engagement Connector Coventry 2021 were on hand, along with Lady Godiva, Pru Porretta and representatives from the Interfaith Group to plant four commemorative statement trees to mark the official launch of the initiative - including one statement tree, specifically dedicated to Coventry being chosen as the third UK City of Culture 2021. Inspirational prayers initiated proceedings with hundreds of students from Longford Park and Grange Hurst Primary Schools, along with dignitaries from local churches, including Coventry Cathedral and St. Pauls Church, Mandhirs (Hindu temples) and Gurdwaras, who planted over a further 100 saplings on the day. Planned in conjunction with Coventry Council and the Park Service Rangers, the Sikh Union, along with The Friends of Longford Park, and a team of dedicated volunteers, will be planting a variety of five native trees and shrubs in Coventry’s parks and green spaces, including Northern Red Oak, Acer, Hazel, Common Hawthorn and Crab Apple. “This is a wonderful programme and highlights the day-to-day activism that is taking place across Coventry. “The 2021 programme will seek to create projects that will improve the bio-diversity of the city to make the city a healthier place to live and play in. “We are delighted to see Coventry’s Sikh community leading the way with this great project. We have recently recruited a new member of the 2021 team who will focus solely on the environment and our green futures. Kerry Bigham, Chairperson, Friends of Longford Park says: “Climate change is affecting young people. Planting trees is an activity that safeguards the future of our children and our planet. “We are delighted to see local communities and in particular, students from Longford Park and Grangehurst Primary Schools coming together, to actively seek to improve their environment is magical. Jen Goode, Deputy Headteacher, Longford Park Primary School says: “We passionately believe in fostering positive relationships with the local community, with an emphasis on children to demonstrate respect, understanding and acceptance to all. “Collaborating and working alongside the Sikh Union was a wonderful opportunity for the children to engage with the wider community, whilst understanding the significance of Guru Nanak Dev Ji’s 550th birth-anniversary. “Our school backs onto Longford Park and the project is a unique opportunity to educate the children about their local surroundings, whilst developing a new woodland area. The primary site is at Longford Park (also known as Marconi Khalsa Wood) - where 300 trees were planted by staff working at Marconi Communications in 1999 as part of the Millennium Woods project, marking the tri-centenary of the initiation of the Khalsa – collective body of baptised Sikhs. The initiative is part of a wider global effort by Eco-Sikh, an environmental organisation based in Washington, USA to plant over 1 million trees around the planet to mark the 550th birth-anniversary of Guru Nanak, the founder of the Sikh religion.